Australian readers report trouble in Humpty Doo. 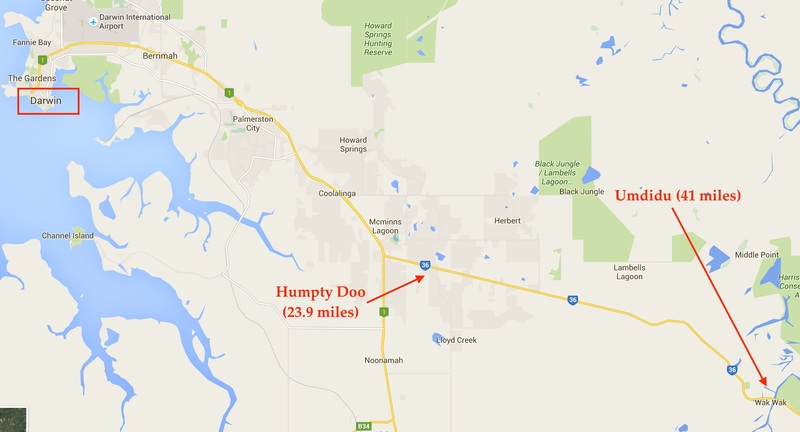 And speaking of places you might go, non-Australians may be wondering, as I did, what the f*$% is “Humpty Doo,” anyway? Well, here comes knowledge. Humpty Doo is a township of about 6,000 in Australia’s Northern Territory, about 24 miles inland from Darwin. It was once best known for being the site of “one of the great failed postwar agricultural experiments,” an effort to grow rice there in the 1950s and early ’60s that ended up being a “total disaster.” But it is now said to be a fairly normal adjunct to Darwin, and is likely best known for its name. Businesses there make full use of it: There’s a Humpty Doo Hotel, Humpty Doo Tavern, Humpty Doo Apiaries, Humpty Doo Fitness, etc. (There’s also a Humpty Doo virus, but they probably don’t publicize that much. It only affects kangaroos anyway, so don’t let that deter you.) And though it is located in a land of many interesting place names, there’s something about “Humpty Doo” that seems to set it apart. No one seems to know where the name came from, including the Northern Territory’s Place Names Register and Place Names Committee. They give four possibilities, three of which are: (1) the use of “humpty doo” in Australian slang to mean “all wrong or upside down,” possibly deriving from Humpty Dumpty; (2) an army slang term, “umpty,” for the dash used in Morse code; and (3) the place name “Umpity Doo,” which they say appears on a 1910 survey plan. Only the last of these is said to be based on a document, so let’s start there. The first slang term was in use before 1910, but it’s not clear the other was; setting that aside, neither seems to make much sense as a place name (but see below). But while “Humpty Doo” certainly could have evolved from “Umpity Doo,” that solves nothing for what I hope are obvious reasons. So the fourth possibility—that both are a corruption of some older Aboriginal term—seems more likely. Here I think we are on to something. That ties in with a reference on the same site to the Herbert family, saying that Charles Edward Herbert moved to Darwin in 1884 to practice law, a project that fell short of success only because the area in fact was totally unsuited to practicing law and the clients he did find were promptly devoured by rats, birds, and buffaloes. Okay, I’m just speculating there, but even if he did succeed as a lawyer, the site says he also became “keen to explore live cattle exports” in the area, “which at the time included Umdidu (Humpty Doo) station.” This isn’t clear, though, as to whether it was actually called “Humpty Doo” at that time, or what the “time” was. Sources also mention the 1915 book “An Untamed Territory,” by Elsie Masson, specifically chapter VI, “By Motor-Car to Umdidu.” In this she relates the “bold experiment” of driving from Darwin to Umdidu station instead of taking a reliable horse. (Spoiler alert: they survive.) That suggests the place was called “Umdidu” as late as 1915, although somebody could have misspelled it “Umpity Doo” in 1910. But there’s a problem: Masson says (p. 86) that Umdidu station is “forty-one miles from Darwin.” Humpty Doo is less than 24. She could have been wrong, but that’s a pretty specific number. Also, driving 41 miles from Darwin along the same road puts you exactly at the biggest river in the area, the Adelaide, which seems like a logical place to put a hunting station (though Masson doesn’t mention a river). Were these two entirely different places? Did somebody like the sound of “Umdidu” so much he stole it and misspelled it “Umpity Doo”? Why is that place called “Wak Wak” now, according to the map? Maybe more importantly, will you guys support me if I get fired for spending more time on this than my billable work? The answers to these questions must remain unclear for now. Darwin was named “Palmerston” at the time, so this is referring to a tavern in that city. It shows there was a bar named “Humpty Doo” well over a decade before Masson’s trip to a place still called “Umdidu.” So the bar’s name must have derived from the slang term mentioned above, not the station. And that makes it more likely that the town’s name was derived the same way, with “Umdidu” just being a coincidence; or, according to the theory I now prefer, the town was just named after a bar. I look forward to hearing from any Humpty Doovians Humptiduvians who may have additional or different information.